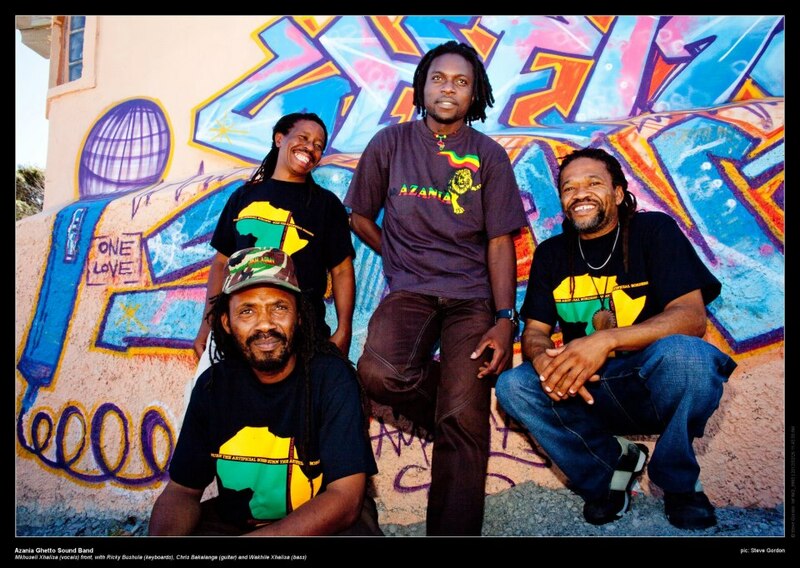 Azania (The Ghetto Sound band) is simply the best reggae band in South Africa! The band consists of six brilliant musicians hailing from the townships of Cape Town. The band has played in most well known venues in South Africa and has shared the stage with international Reggae superstars Burning Spear, Culture, Mutabaruka, the Wailers, Buju Banton, Bunny Wailer and Macka B. The band has also worked as a backing band for a number of international reggae artists namely Dawit Menelik Tafari who produced and features in their debut album A True Story, they also backed the UK based Jamaican (JA) singer Vivian Jones, Cedric Meyton of the Congos(JA), Iqulah (JA), Starkey Banton (UK), Ossie Gad (from the Natural Ites), King Kong (JA), Teddy Dan (JA), Iqulah (JA), Ras Jabulani (Trevor Hall) and Yasus Afari (JA). The band recorded and co-produced an album with Vivian Jones, the album is called Tribute to Gugulethu Seven. Azania Band is the backing band for all the artists on a compilation album called “Ghetto Sound Vol 2” which features Cape Town artist like Crosby, Teba, Chad Saaiman, Vido Jelashe and international artists like Prince Malachi (UK), Peter Spence (UK), Jimmy Riley (JA), Yellowman (JA), C-Sharp band plus more artists from South Africa and Jamaica. The Band’s key members Wakhile and Ricky are playing and were involved in creating some of the music in Mutabaruka’s latest album “Life And Lessons”. Azania Band recently released a collaboration album, featuring FreddieMcGregor, Luciano, Bushman, Junior Kelly, Yami Bolo, Tarrus Riley, Everton Blender, Anthony B and many more top international Reggae artists.Azania Band is currently busy in the studio working on two albums, with the second album being a collaboration album featuring the top Jamaican artists, Capleton, Sizzla, Toots Hibbert, Dean Fraser, Laza Morgan of LMS, including Irie Love from Hawaii & Link I from Antigua, and many more top international Reggae artists.